At Cades Cove Riding Stables, you can choose whether to go on a trail ride, carriage ride, or hayride. If you enjoy horseback riding, or you are a beginner who wants to learn the ropes, you will love taking a trail ride in Cades Cove. Comfortably mounted on a well trained horses, you will spend about an hour exploring this incredible region. Riders will travel through streams and forests, with terrain that is sometimes hilly, and consistently breathtaking. Carriage rides are a fun and old fashioned way to see Cades Cove. As horses lead your carriage along the picturesque trails, your guide will point out plants, animals, and share some interesting historical facts. Up to six passengers can share a carriage ride, so this can be a fun way to see Cades Cove with your family or a group of friends. Guided hayrides are still another type of tour offered by Cades Cove Riding Stables. Guests sit in a trailer filled with hay as they ride through some of the most scenic countryside in Cades Cove. This is an activity you can enjoy with your family or with a large group, as hayrides can accommodate as many as 65 passengers. The horseback riding season is from March 14 through November 30. Hours are from 9 a.m to 4:30 p.m.
Prices: $30 per hour trail ride, $12 per half hour carriage ride, $12 per one and a half hour hayride, $14 per two hour hayride led by park ranger. Reservations can be made for group hayrides but not for trail rides or carriage rides. All rides are Western style. Trail rides are limited to nine riders per group, making the experience nice and intimate. For trail rides, you should wear long pants and shirts with sleeves. Make sure you are wearing closed toe shoes or boots that fit securely and have a half inch heel. Loose fitting clothes, shorts, and athletic shoes should not be worn for horseback riding, regardless of the season. Avoid carrying anything that might interfere with your comfort or balance, such as cameras, phones, purses, or backpacks. Horseback riding is safe for adults and children who are at least six years old. Parents double-riding with kids is not permitted. For safety reasons, pregnant women, people who weigh more than 250 pounds, or older adults with health issues should not ride. People who cannot ride due to age or health reasons always have the option of choosing carriage rides or hayrides. Riders of all levels of experience, even complete beginners, can participate in Cades Cove horseback riding. Horses are trained to walk and never gallop, so there is no need to worry about the horses going too fast. On the other hand, even experienced riders will enjoy the incredible scenery of this unique area. 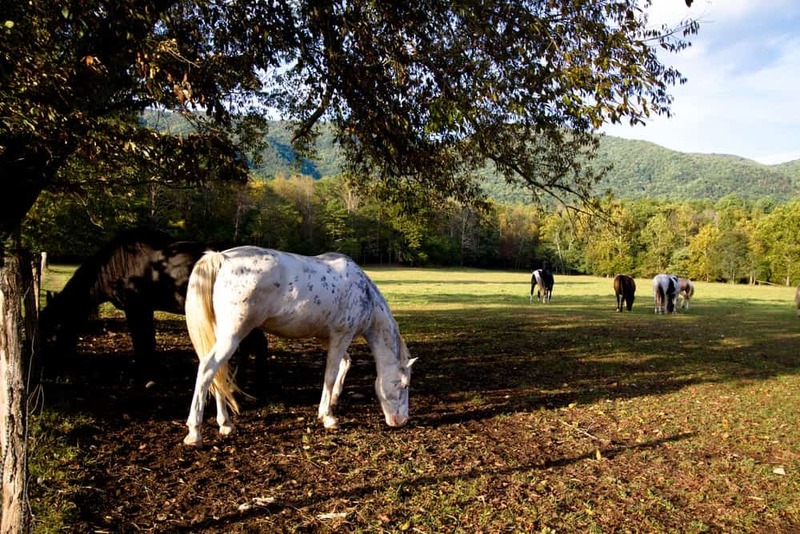 Seeing a variety of animals is one of the chief pleasures of taking a horseback riding tour of Cades Cove. The type of animals you are likely to encounter will depend on the season and the time of day. Whitetail deer are common all year round, though fall is breeding season and when they are most prolific. You are mostly likely to see wild turkeys during their breeding season, which is spring. If you are riding anytime between late spring and early fall, you may see black bears. Other animals that you may see include coyotes, river otters, and pileated woodpeckers. For more information, check out these 6 essential tips for Cades Cove wildlife viewing!